← We’re excited to be here! In answering that secret sauce question we’ll try not to be too techno-geeky. OK, we’ll make some statistics references and throw in some cool sounding words like “algorithm”, “precision”, and “indexing”. But we’ll use a simple example to illustrate how GenGophers.com’s unique technology works relative to typical book search engines. Even with that, if you’re still squirming with the details, don’t feel guilty about bailing out at any time and waiting for the next blog. Or, find your nearest freezing/overheated statistician if you need some help. Here’s our example situation: You’re trying to find more information about your ancestors, William David Smith and Harriett Susan Smith, who were married in Michigan in 1895. With tens of thousands of family and regional history books on the web, you know that some of them can add some interesting new facts to what you already know. But how do you dig through all those books (and all the pages in all those books) to find your Bill and Hattie?!? To start your search for Bill and Hattie you enter into the search form the name, William Smith (without quotes). The engine will search its index for those two words and return every page from every book having both the word William and the word Smith. It could be that you find your relative William Smith as shown in Example A below. Bingo! The common solution most of us use to solve this problem – the search engine not correctly associating the names William and Smith together as one person – is to use quotes around the name “William Smith” when initiating the search. 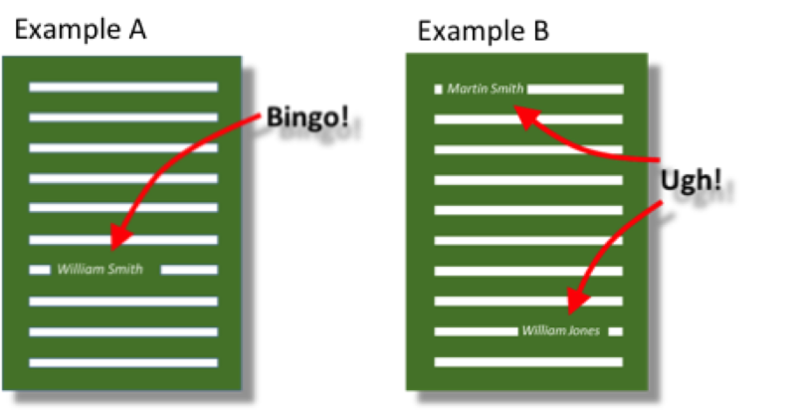 Forcing the association in that way could again create a “Bingo!” moment as shown in Example A above. In each of these common cases the search engine will miss returning a hit on your relative (even though this is actually him!) because the words it’s indexed don’t match the precise term you supplied in quotes, “William Smith”. Some search engines, such as Google’s, provide some search feature (wildcards, for example) that may return matches in some of these cases, but not all. This is probably enough ice and fire for one blog post. But we’ll mention in closing that the Genealogy Gophers’ search technology also attaches statistical probabilities to each of these name, date, and place associations it makes. It then uses those probabilities to rank order the results it returns on each search you make. We’ll save that exciting story for a future blog! We know the statisticians among you can’t wait.